We here at Deckstainhelp.com remain committed to being your source for industry insights and trends for the perfect deck stain. Please note that your deck should be dried for a few days prior to stain application following prep, excluding Restore-A-Deck stain, which can be applied on the same day as the prep. We encourage comments so feel free to leave us one below. 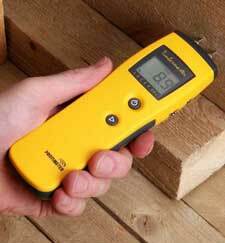 What Should Be the Moisture Content of Deck When Applying Stain? A deck staining project is something any do it yourself enthusiast can accomplish. Most of what needs to be done can be found online on how to articles. Cleaning the deck with the proper chemicals and methods is crucial. However, after the deck is cleaned and ready to be stained there are a few things to consider that can make or break the success of the project. Once a deck is cleaned it should be allowed to dry for several days before the stain is applied. Most stain manufacturers have recommended drying times that may vary slightly. In addition to varying recommendations, other factors like weather, sun exposure, wood type, wood age, and porosity can also determine the exact amount of dry time a deck needs when applying the stain. When all things are taken into account, it would seem logical to wait a long enough period so there is nothing left to chance. So what should be the moisture content of the deck when applying stain? It Rained Shortly After Staining. What to do? Update for 2019: It Rained Shortly After Staining. What to do? We continue to appreciate your input, so feel free to leave a comment below if it rained on your deck shortly after the stain was applied. Any pictures of your deck stain project will help. It is best to never stain any exterior wood when inclement weather is forecasted, especially rain. Most deck stain brands will warn against the application of their product within 12-24 hours of rain being forecast. But as we all know sometimes the weather is not so predictable. So what do you do if it does rain shortly after staining? You cannot do much until it stops raining once it starts. After the rain has passed and the deck has dried take a closer look. It really depends on how hard it rained and for how long. A light drizzle most likely won’t hurt anything but a good downpour can be a different story. The type and brand of stain can make a difference as well. Some stains can handle rain shortly after being applied better than others.